The Fight for the Sky is a short propaganda film commissioned by the US government to highlight the victories of the Allied air forces over Europe prior to the Normandy invasion and narrated by Ronald Reagan. Opening with shots of aerial combat over Europe the film turns to footage of the airmen acting casually in their base in East Anglia, reading newspapers, playing ping pong, and listening to the radio. However, they are soon called for a debriefing about their next mission, a strike deep into Germany’s industrial region, the Ruhr. They ready their planes and arrive over their targets like clock work, shooting down some German Luftwaffe planes in the process. None of the missions have failed due to enemy resistance alone, the narrator informs the audience, though some haven’t succeeded because of weather conditions. 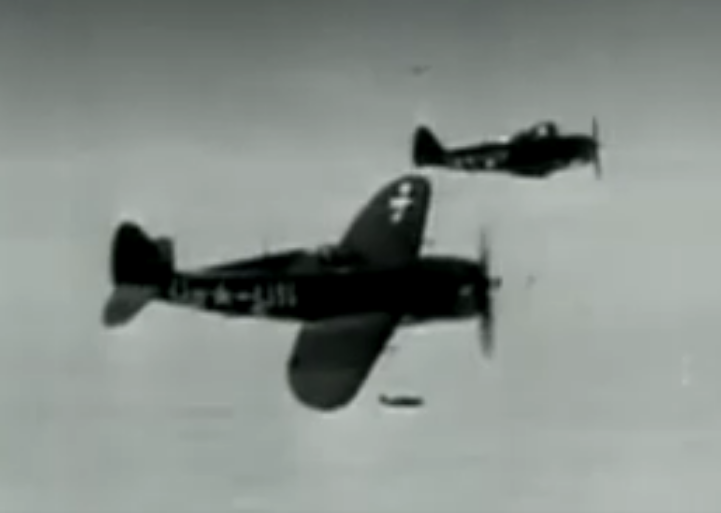 Captured German footage is shown to prove that the enemy was just as determined to stop the attacks as the Allies were to carry them out. In February 1944 a new bombing initiative is begun. Instead of waiting to be attacked by the Germans the Americans will seek them out, targeting German airfields. Then the focus turns to enemy transportation, and the Allies make it impossible for a railroad to operate at day, also targeting trucks, barges, and even flak towers. All this made the eventual landings at Normandy and the opening of the second western front possible. With victory won in Europe, it must now be won in the Pacific.